What is a Gallery Site in Asianart.com? 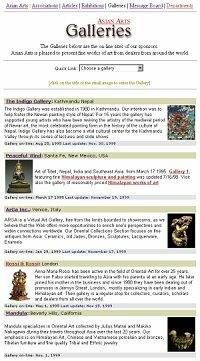 A gallery on Asianart.com is your own site on the Internet, with its own unique address, within the attractive context of Asianart.com, which draws visitors specifically interested in the arts of Asia to your material. An elegant "home" page, containing a brief (typically one paragraph) introduction to your gallery or business and thumbnail images of each of the works of art you wish to display to the Asianart.com readership. Each thumbnail image is approximately 2 inches or 5 centimeters high. Larger galleries may be divided into two or more sections, each containing material of a different type or quality; in this way your gallery may have several "rooms." Each thumbnail image is linked to an individual page with a high resolution full screen image of the same item with a text caption. All of the images are optimized to download as quickly as possible over any type of connection. Also linked to the main gallery page is a full text introduction and description of your business, the "about " page which is entirely optional. What you list here is entirely up to you, but we suggest a description of your business specialties and areas of expertise, a brief history of the business, and perhaps a description of past and future exhibitions. A traveling schedule can be posted here, or news of any recent acquisitions. Your text pages can be updated at any time. Your gallery will also contain an interactive response form which allows the visitor to pass a message directly to your e-mail address from within your gallery. This convenient feature allows the visitor to act immediately to get further information from you or to reserve or order an item. All galleries include a subscription and e-mail management system allowing your gallery to collect a subscription list of e-mail addresses, to whom you can send mailings of changes to your pages. Password protected, easy to use Gallery Generator software which allows you to replace images and update your site whenever you wish. You have total control over the images, description, main text, about text captions, contact info, font size and colour. Prominent link to your own web site, if any. Submission of your gallery site to the Internet Search engines and have your site prominently listed. We submit your gallery site to the various search engines according to the description and keywords most appropriate to your specialties. Thus, a gallery site contains a main gallery page, an introduction or "about" text page, a response form, a subscription form and individual image pages for each piece presented. Any number of pages can be added to your site, although the above pages are standard features of all gallery sites of any size. To get a more precise idea of what a gallery is like, there is no better way than to see a real gallery! Click here to visit our Galleries pages. Click here to find out how much a gallery costs.